If you're a fan of the B&W combo like I am, you probably are a fan of the houndstooth print as well. It's a classic print that has been around for decades. I've been looking for a houndstooth skirt to add to my closet for quite some time. While browsing, this skirt immediately caught my attention. Not only because of the classic print but the trendy cut as well. Fun details can help spice up a dreary outfit. This was my first time order from Front Row Shop and I am impressed with the quality of this skirt. The material is thick and sturdy in person (fully lined). The waist measures 12.5" (laying flat) and I couldn't have asked for a better fit. The simplest way to wear the houndstooth print is to pair it with any solid blacks or whites like I did here. To spice up the otherwise more traditional color combination, I added this gorgeous statement necklace for a pop of color. Adding a statement necklace is also an easy way to dress up your sweatshirt. If you're interested in this necklace, stay tuned for a giveaway later this week. 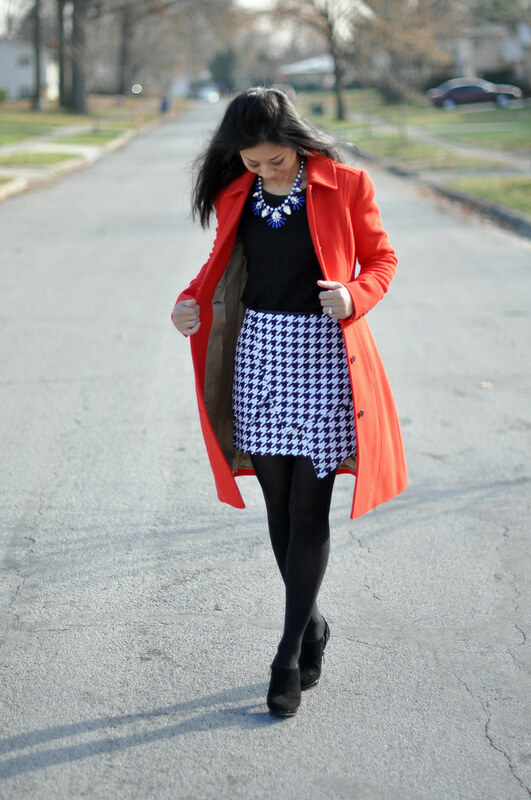 I love how you styled that chic houndstooth skirt with the brightly colored coat...makes a big statement! Unique cut on that skirt! What a beautiful necklace. Nice to see you partnering with Yuni again for a giveaway! love the outfit my favorite piece is the trench coat so cute! Love the wrap on that skirt, so unique! Love that houndstooth skirt and that jacket. You look so pretty! That is a great alternative to wear to work and still looking classy. I adore your skirt and that jacket. have a great Thanksgiving.